Accent Gold is designed for adding 24K gold highlights to silver clay (both fired and unfired) but can also be used on fine silver, sterling silver and Argentium silver. 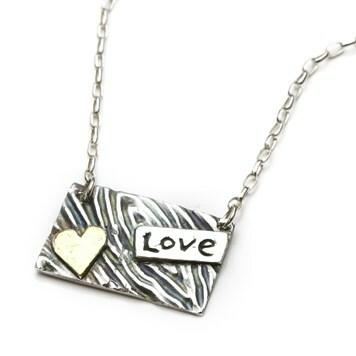 This is a great way of adding value to your pieces by applying and enhancing detail in gorgeous, bright 24 carat gold. 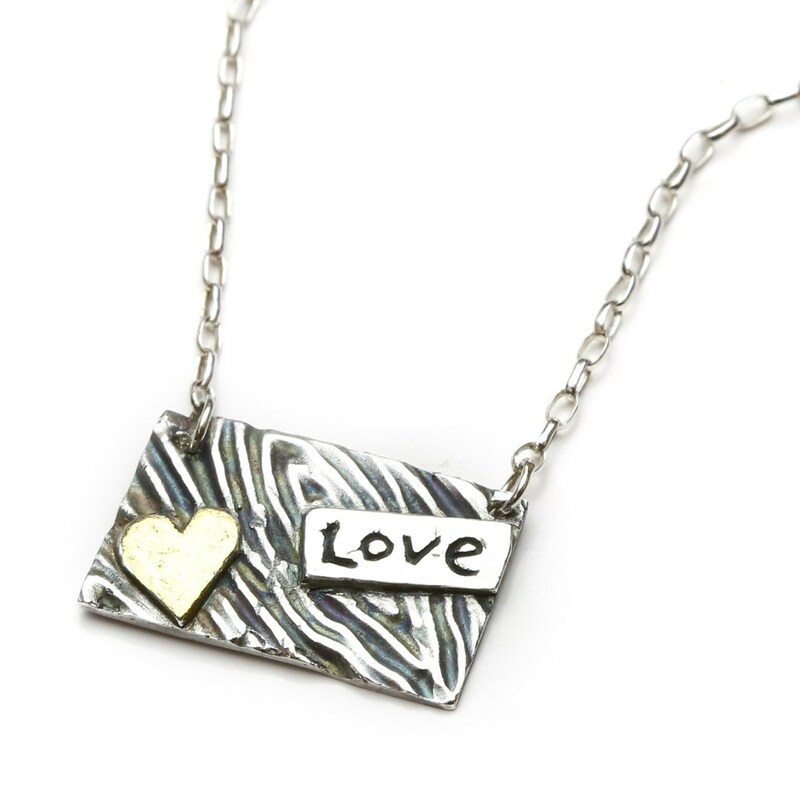 On this page we go into detail about how to use Accent Gold with complimentary instructions from experienced metal clay artist and instructor Petra Wennberg. 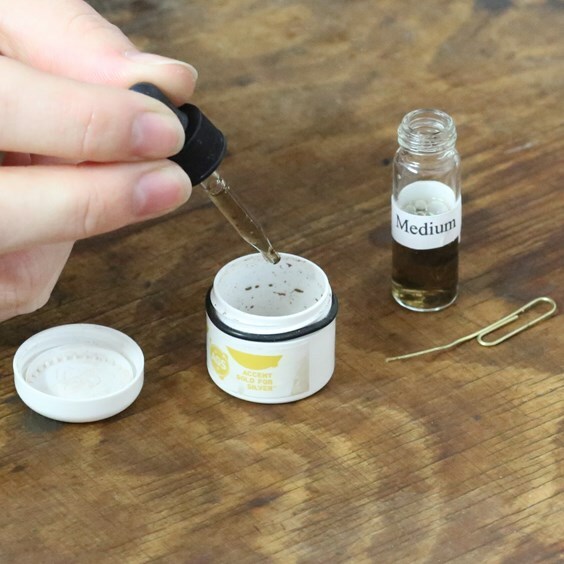 Whilst there are instructions that come with the product, Petra and other metal clay users (including ourselves) have found the following method works beautifully with amazing results. Accent gold comes with 1 gram of 24ct gold powder, a bottle of glycerin and a dropper. You create the gold liquid by mixing drops of the glycerin (also referred to as 'the medium') with the 24ct gold powder. Add about 5-8 drops of medium from the glass bottle and mix carefully with a straightened paperclip. If the mixture is still too thick, add a few drops of water only (distilled is recommended, however tap water creates no problems). Only add one or two drops at a time until the consistency is perfect. You want it to have the consistency of thick-ish single cream – if you scoop it up on a brush it should slowly drip off. The mixture should be completely smooth, no lumps or dry bits in it. Your mixture will dry up slowly over weeks or months as it stands in the pot. Every now and then you can simply add a drop or two of medium, or water, until it is the right consistency again. Always stir well before use. After you have stirred the mixture, scrape off as much as you can from the paperclip. Any left on the paperclip can left to dry, so that you can flake it back off into the pot. However, do this after you have finished using it so you don’t get dry flakes on your design. Next time you use it, just stir the flakes into the mixture. Apply one smooth layer of Accent gold - if applied properly this is all you need for a nice deep gold colour. Apply the Accent Gold straight onto the fired UNTOUCHED silver... whilst the manufacturer's instructions state to apply the paste on before applying the Accent Gold, both Petra Wennberg and ourselves have found that not applying the paste before applying the Accent works well. If the mixture is too thick, it will be very hard to apply evenly, it will also look dry and flaky on the silver. You can add a little water to a small brush and use this to smooth it out. However, thinning your mixture before applying is much easier. Apply with a silicone tipped clay shaper, which is a little easier than using a brush. Plus, when finished you can leave it to dry on the clay shaper and then simply flake it off back in the pot again – no more lost gold from rinsing brushes! Make sure the layer you apply is thick enough to cover the silver. 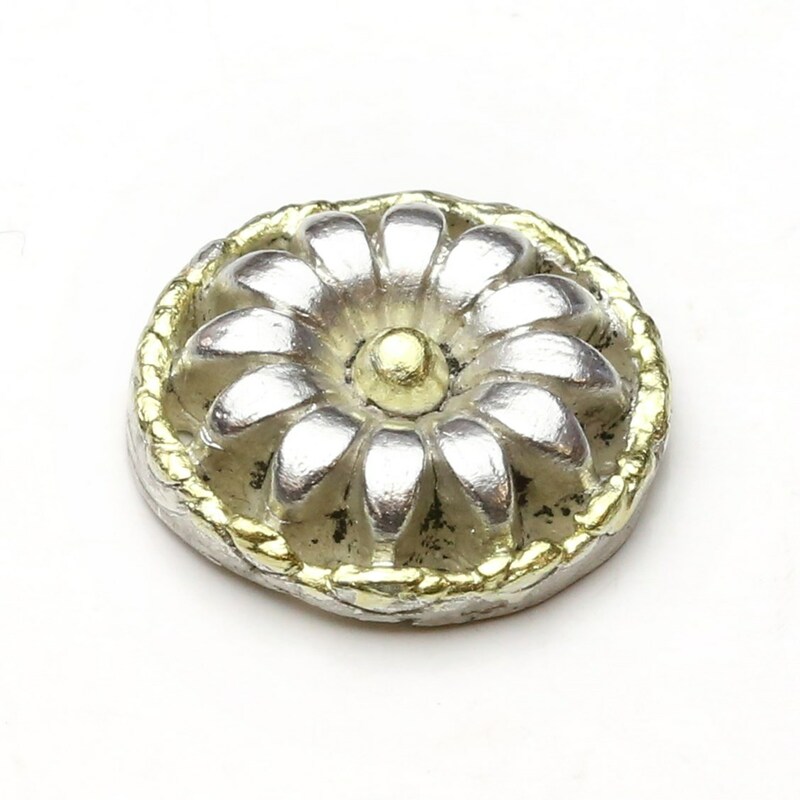 If you can see silver shining through the gold, it could be that your paste is too thin, or you simply dragged the brush or clay shaper a little too hard against the surface. Carefully dab a little extra on where needed. You want a smooth even layer – not something that looks like a thickly applied grainy dry paste. Leave to dry naturally – don’t speed it up on a hotplate or with a hairdryer. We recommend applying the paste in the evening, dry overnight, and fire the next day. 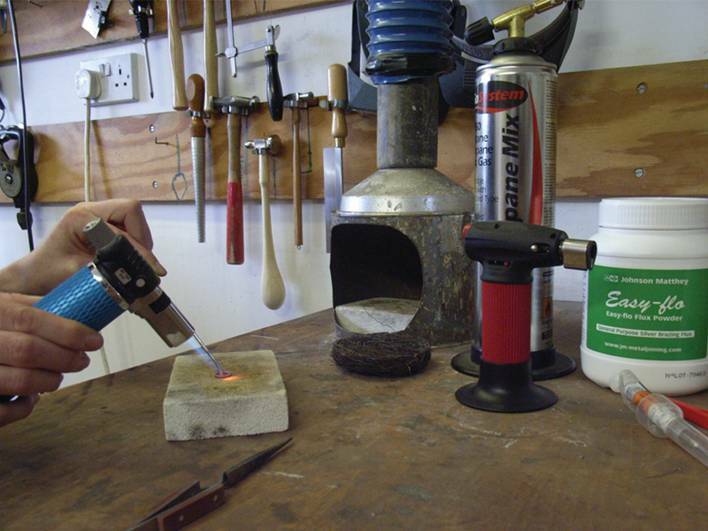 Fire with a gas torch... a torch is very easy to use with a little practice and a kiln doesn’t work as well with Accent Gold. Heat up your design to a nice soft glowing peachy colour. When you start to heat an already fired metal clay piece it sometimes goes a little brown, almost looking burnt. This will disappear as you keep heating it and it starts to glow. Keep the glow for about 2-4 minutes, trying to keep it consistent for the whole time. Adjust the glow by moving the torch nearer or further away from piece. Don’t heat it too much so it starts to go bright orange. It is also important not to focus the flame on the gold – keep it on the surrounding silver. 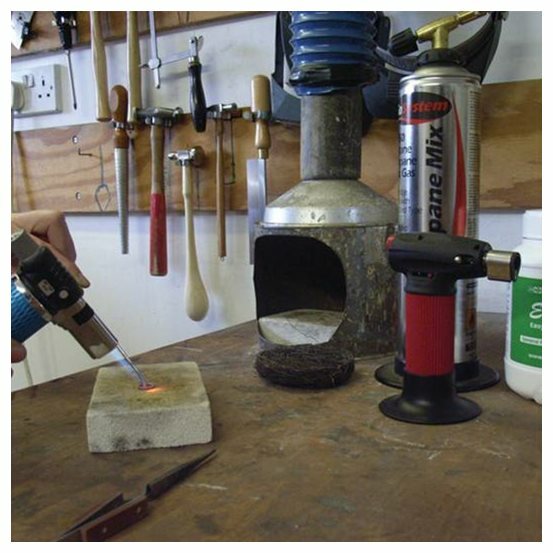 It is sometimes good to burnish the gold whilst it is still hot by holding the design with tweezers of similar (try not to scratch it) and burnish the gold part the help bond it to the silver. This is a technique used in KeumBoo (bonding gold foil to silver using heat and pressure). I then brush my piece using a very soft brass brush, which leaves a nice satin look on the silver; this is all I need to do if I don’t want it highly polished. You can then follow up with polishing papers, tumbler, or liver of sulphur – depending on what finish you’re after. Here are a few examples of some designs we have completed with Accent Gold. 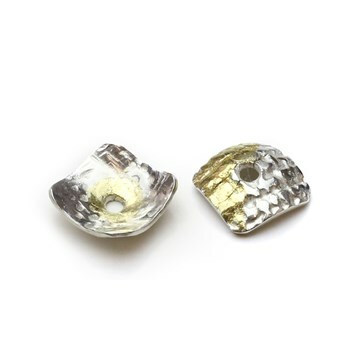 To view Accent Gold For Silver click here. Share your creations with us on social media - we would love to see them!